The call didn't surprise me. I've been getting similar calls every now and then for years. It sort of comes as part of the package if you get as deeply involved in fishing and writing about it for as long as I have. If you do it figures you'll sometimes hear from folks wanting to know if you can point them to a spot where they are guaranteed to catch fish. I won't usually do that. Fish don't come with guarantees. If you've not found that out already you eventually will. But there are spots here and there where I'll make exceptions. Once such is the subject of this column. Looking for a spot where you can find excellent fishing for both largemouth and smallmouth bass? Let me tell you about such a spot and what happened one of the last times I was there. Our guide slid his boat into the beautiful central Oregon River at 8 o'clock in the morning. By day's end we had caught more than 150 smallmouth bass---and we hadn't seen another boat all the time we were on the water. There's more. The day before catching all those smallmouth my companion and I had boated more than 50 largemouth bass. They came out of a small lake hidden away in the hills not far from the river where we caught all the smallmouth. Sound like a fairy tale? No way, my friend! At least it's not if you have the good fortune to drift the John Day River in the Fossil area of Oregon with that region's most experienced guide. The John Day River curves through peaceful Central Oregon before it dumps into the Columbia River. The river provides excellent action for smallmouth bass. Some of those smallmouth we caught topped 18-inches. That 18-inch size might not sound like so much to a salmon or steelhead angler unfamiliar with smallmouth bass. Guess again! For my bucks few freshwater game fish fight harder than river smallmouth. Use light tackle, and that's what's required if you expect to put many in the boat, and they'll flat wear out your wrist. The trip I've mentioned wasn't the first nor the last time I've been on the John Day with the guide I've mentioned. He is Steve Fleming, of Fossil, Oregon. Fleming runs an operation called Mah-Hah Outfitters. He's been at it for years. I've never been with a guide who works harder, or more efficiently, to see that his clients get fish. As mentioned, I've made several trips with Fleming. Most of those trips were made in late June, a time when you might think good action for sizeable smallmouth had tapered off a bit. It hadn't. On both occasions the credit for our success was due to Steve Fleming's angling expertise. Book a trip with veteran guide Steve Fleming and you'll fish from his comfortable drift boat as you float downstream. I've kicked around the world a good bit on fishing adventures of one kind or another over the past half century. It isn't often these days you'll find a river in the United States where the smallmouth bass fishing is as good as it is on the John Day. You'll likely hook John Day smallmouth a good bit larger, but fish this size will keep you comfortably busy for awhile. 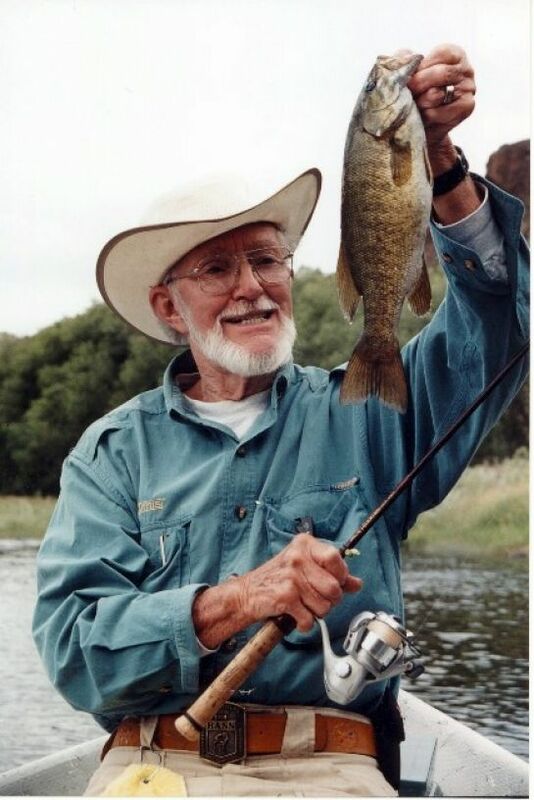 A light spinning outfit is ideal for John day smallmouth fishing. And you could say the same thing about having lots of competition. 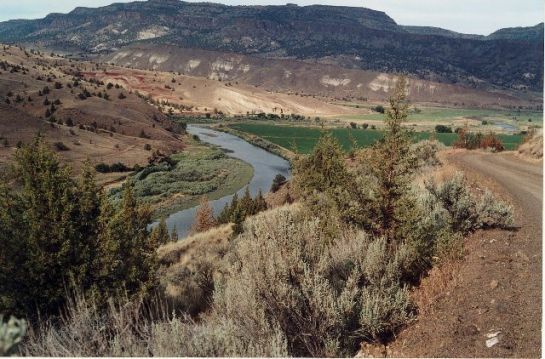 Perhaps other areas of the John Day are subject to the pounding so typical of most productive rivers, but that certainly isn't true of the sparsely populated region of the river Fleming fishes. The results I've detailed regarding this one trip have been repeated every time I've been there. One of the reasons it continues to be so productive undoubtedly is due to the conservation procedures Fleming and his clients follow. Anglers who fish with Steve know going in that they will be expected to practice catch and release. Every one of those 150 plus bass my friend and I put in our boat on that trip I mentioned was there but briefly. Once we got them unhooked they went back into the river. They'll be there to thrill the next anglers Steve guides down the river. As anybody who ever hangs his fishing hat in Oregon very long usually finds out, it rains in that part of the world now and then. I've had people tell me it never does anything else! When it does rain, rivers often get high, dirty and sometimes unfishable. Fleming doesn't sweat it when the raindrops come. You've heard that old bit about having "an ace in the hole." Well, Steve Fleming is a guide who has "a hole that's an ace." Let me explain. Do you recall my mentioning the 50 plus largemouth bass we caught the day before we hammered those John Day smallmouth? Those largemouth weren't river fish. They came out of a small private lake to which only Steve and his clients have access. We didn't get on Steve's private bass lake until mid-morning on the trip I've detailed. Even so we caught those half a hundred largemouth by mid-afternoon. My biggest was an 8-pounder that smashed a gold colored Cordell Red Fin. The bluegills in this little lake provide forage for the bass. If things haven't changed, I'd be willing to bet big bucks I could take my fly rod to Steve's private lake and catch 100 bluegill an hour if I chose to work at it. The lake is simply loaded with those little devils. It isn't unusual to have a dozen of them chasing the lures you're throwing for largemouth. Some of those largemouth in the private lake guide Steve Fleming fishes are dandies. I nailed this one there on a Cordell Red Fin. Booking a trip with Fleming gives you a choice. Many of Steve's clients opt to do as I usually have. That is to fish for largemouth one day and a second drifting the John Day for smallmouth. 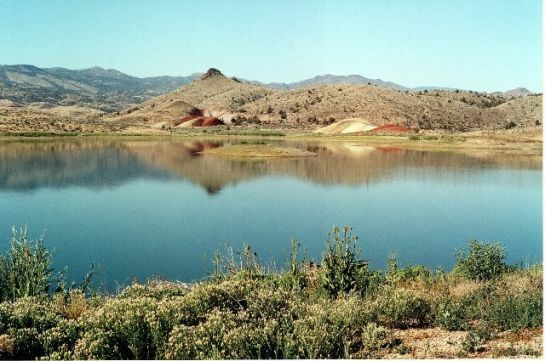 You'll get plenty of exercise casting and catching fish on a trip with Fleming on either the John Day or his private lake, but don't count on losing weight while you're there. Besides his guiding skills, Fleming is a cracking good cook. Chances are about mid-morning you'll notice your tastebuds doing a toe dance as the odors from a Dutch Oven come wafting up from the middle of Steve's boat. He fires up the charcoal in his oven when the trip starts in the morning. Around noon the food he has prepared is fully and expertly cooked. At that point Steve heads his drift boat to shore and ties up. Once there he serves his clients a delicious and piping hot meal right there on the riverbank. One of the Pacific Northwest's top fishing guides is just as expert with a Dutch Oven as he is in catching fish. 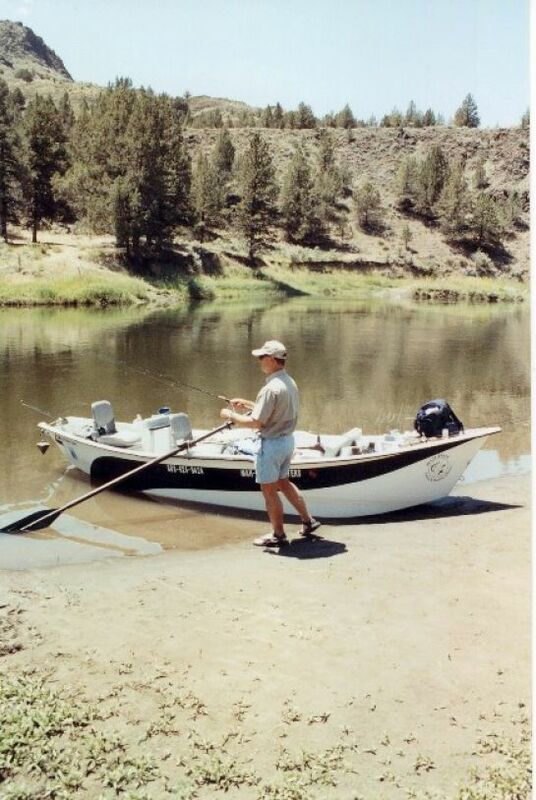 Drift Oregon's John Day River with him and he'll prove that to you. Here Fleming has set up a small table right on the shore of the John Day. Note his drift boat in the background. Like I said in the beginning, fish don't come with guarantees. Anybody who tries to tell you they do is the same barefaced liar who maintains he fully understands women. 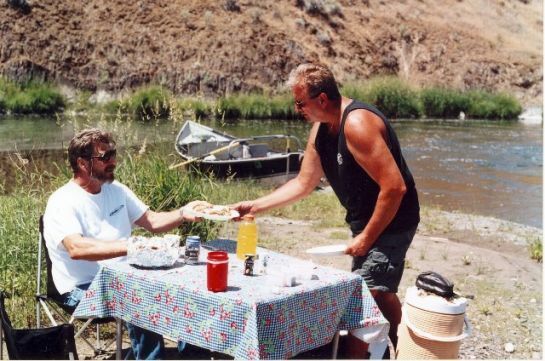 But as I said in the beginning, I'll make make an exception if you line up a trip with Steve Fleming to fish the John Day. 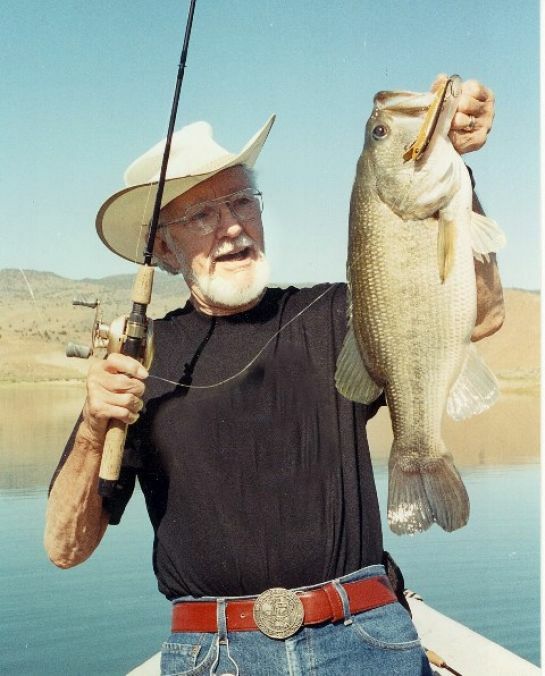 Listen to the man, do what he tells you and you will catch fish. Even inexperienced anglers can score here. It's a great place to take your wife and youngsters. If you want more details on Fleming's Mah-Hah operation they are easy to obtain. His Internet website has a wealth of information. You'll find it at www.johndayriverfishing.com. His toll free number is 1-888-624-9424. Line up an adventure with him and my guess is it will be a trip you'll never regret taking.